Talk about strange tales from the crypt. Jim Stingl of the Milwaukee Journal-Sentinel reports that a cemetery worker has admitted to stealing a $2,000 Fender Telecaster from the casket of a man who loved his guitar so much he wanted to be buried with it. The grave robber, Steven W. Conard, 39, of Green Bay, Wisconsin, said he took the guitar to rescue it from an eternity of darkness. Our very own Tele-master Greg Koch was interviewed for the story. "It's just weird," said Koch. "One Telecaster, out of all of them, going into the dirt nap is not really the end of the world." When asked if he would like to be buried with his favorite axe, Koch said no, punctuating it with, "I played enough here." For the complete story, visit www.jsonline.com. Move over Les Paul. Move over Leo Fender. Move over Paul Bigsby. Looks like Alvino Rey might have a claim to at least a share of the age-old "inventor of the modern electric guitar" debate. Alvino Rey was born Alvin McBurney on July 11, 1908, in Oakland, California. At age 8, he built his first radio, and soon afterward he received a banjo as a Christmas gift, and by age 15, his aptitude for both music and electronics led to him building an electrical guitar amplifier. In 1930, while working in San Francisco, Rey became the first guitarist to electrify the guitar, so he could be heard in the orchestra setting. In spring of 1935, Gibson Guitar asked Rey to help develop a prototype pickup with the engineers at Lyon & Healy in Chicago. The pickup was eventually finished in-house at Gibson by Walter Fuller, and it was then installed in an f-hole archtop guitar dubbed the ES-150, which is now commonly known as the Charlie Christian model, named for the pioneering jazz guitarist who first used it. By this time, Rey had become a rather accomplished pedal steel guitar player and, in fact, is recognized in some circles as the father of pedal steel guitar. But, despite that honor and also being one of the best-paid sidemen in the industry in the 1930s, it was his "talking guitar" experiment for which he may be best remembered. 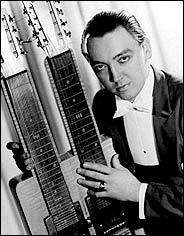 In 1939, Rey used a carbon throat microphone to modulate his electrified pedal steel guitar sound, in a rather crafty—if sneaky—way. During the performance, his wife Luise (who was formerly of the King Sisters singing group) would wear the mic and stand behind a curtain and sing along with Rey's guitar lines. It was coined "singing guitar," and is credited as the first-known talk-box experiment. Here's video of Rey and his singing guitar puppet "Stringy" (Luise behind the curtain) performing "St. Louis Blues," in 1944. Jazz guitarist and entertainer John Pizzarelli brought his trio to Madison, New Jersey, last night (9/27), to help the Shanghai Jazz supper/music club celebrate their birthday, and, well, the delicious Three Chili Chicken wasn't the only thing that was hot! Along with the familiar rhythm section of brother Martin Pizzarelli on bass and Tony Tedesco on drums, Pizzarelli welcomed his old friend and former musical partner Grover Kemble (guitar/vocals) for a delightful set of diverse jazz interpretations. Wielding a thin-body electrified nylon-string acoustic, Kemble's crisp lines and strong, deep tenor offered the perfect complement to Pizzarelli's traditional jazz box and lighter vocal tones. For much of the set, Pizzarelli abdicated to his guest, resulting in a more blues- and pop-driven set that included the Calypso beats of Harry Belafonte's "Shame and Scandal" (arguably the highlight of the set, judging by audience reaction), the Creole sounds of Elvis Presley's "Crawfish," and fabulous interpretations by both Kemble and Pizzarelli of several Beatles tracks including "Things We Said Today," "No Reply," "And I Love Her," and "Can't Buy Me Love." If you're in the Central/North Jersey area or even New York City, Pizzarelli is performing again at Shanghai Jazz tonight, with his father, the legendary jazz guitarist Bucky Pizzarelli. Visit ShanghaiJazz.com for more info. For all the latest news and tour dates on John Pizzarelli, visit JohnPizzarelli.com. Here's video of Pizzarelli and Kemble performing "Headed out to Vera's" (which they did last night as well) at Carnegie Hall in 2005. The song is a tribute to Pizzarelli's Aunt Vera, who often fed Pizzarelli and Kemble in their early days of performing around North Jersey. I've been a fan of shred guitar since the first time I heard Yngwie back in 1984, and then Vinnie Moore and Tony MacAlpine shortly after. Since that time, I've met and interviewed and even taken a lesson or two from some of the top names in the shred guitar genre. But aside from Yngwie—who was, is, and always will be the greatest shredder on the planet—I don't think I've ever been as blown away by shred technique as I was last week while editing our new batch shred guitar video lessons by Musicians Institute instructor Greg Harrison. Said simply, Harrison has redefined the concept of "jaw-dropping technique." Oh, and did I mention he's using a NINE-string guitar?! Ever since Michael Hutchence passed away—much too early—in 1997, Australian rockers INXS have essentially been wandering the outback with Crocodile Dundee nowhere in sight. And just when they were once again nearing something resembling their former rock star civilization with their 2005 "INXS: RockStar" reality TV experiment, their winning choice J.D. Fortune quickly discovered he couldn't handle his namesake lifestyle, and it all quickly fizzled. This time, after unceremoniously dumping Fortune—a few times—the band has announced that Belfast-born singer Ciaran Gribbin, a Grammy-nominated singer/songwriter who has worked with Paul McCartney, Madonna, Paul Oakenfold, Snow Patrol, and Groove Armada, among others, will be their man at the mic. They have also posted the first new demo recording with Gribbin, titled "Tiny Summer," at INXS.com. The song was co-written by Gribbin and longtime INXS songwriter Andrew Farriss, who said he "felt magic" again while collaborating with the new singer. "I'm currently writing more songs for INXS with Ciaran, and we as a band hope to share more new music wit you all as soon as possible." "It's all so amazing and sometimes overwhelming, especially when I look up and see that my writing partner is one of the greatest songwriters of our time," added Gribbin. Until the new album is completed, INXS will hit the road in early November to present their new show, INXS "Now Playing" (Like You Have Never Seen Them Before). For all the latest news, visit INXS.com. On September 13, prog-metal titans Dream Theater released A Dramatic Turn of Events, their eleventh studio album and first new skins beast Mike Mangini, who replaces founding drummer Mike Portnoy. A Dramatic Turn of Events is a stunning 77-minute opus from the band that has made stunning the routine. Longtime fans of DT will hear subtle (and sometimes not-so-subtle) hints of their early work on Images and Words. Though some critical fans have gone as far as to accuse the band of lifting their own songs, that's clearly not the case; rather, it's more the typically jazz-affiliated compositional tool of quotation—almost like little audio "Easter eggs" for longtime fans. Another similarity to the band's older work is the greater presence of acoustic piano from keys-master Jordan Rudess—and not just on the ballads like "Far From Heaven." Even heavy tracks like the opening track and first single "On the Backs of Angels" and "Lost Not Forgotten" get the ivory treatment quite effectively. As usual, there are plenty of musical acrobatics spread throughout the album, like the utterly insane "video game soundtrack" unison lines employed by Rudess and guitarist John Petrucci about two minutes into "Lost Not Forgotten" and Petrucci's stellar fretwork throughout "Breaking All Illusions." Finally, there's that whole "new drummer" thing. As much a fan of Mike Portnoy I've always been, new stick-man Mike Mangini's killer performance on this record has pretty much eliminated any potential "drama" from the whole situation. It helps in terms of continuity that many of the drum parts were written by Petrucci prior to Mangini joining the band, but you get the feeling that it wouldn't have mattered one bit. Mangini is a beast and, it seems, indeed the perfect fit for Dream Theater. For more information on ticketing, tour dates and on-sales, visit the official Dream Theater web site.